Omra Kubby currently resides on the Big Island of Hawaii on the East side, with her husband and daughter. She travels extensively and enjoys an exciting life full of adventure and rich in spirituality. Her passion for many practices and purposes have led her to be a juggler of many creative hats. 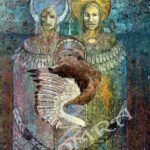 Omra has studied (and continues to study) many cultures and spiritual paths of healing, some of them being Huna, Lomi Lomi, Shamanic studies, Reiki, and much much more. These are a continuing foundation for all of her creations, whether it be music, art or mothering. Among her passions, Visionary art has been a major gift for her to express the immense connection with parallel realities. 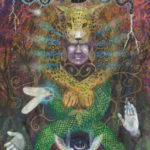 She is a painter and author of The Visions Oracle, a 44 card deck of unique guidance cards. She recently has worked in digital art, blending computer paint with her images for a very refined look. She has dabbled in other artistic areas too, such as Raku sculpture and stone sculpture. She has won multiple awards for her paintings over the years, as well as several worldwide publishings. Omra is also a singer, songwriter and has currently 3 CDs. She plays frame drum and percussion, guitar and sings like an angel. Her genre can be considered earthy/folky/rock/chant. She has played in many different kinds of bands throughout her lifetime, from reggae to unique earth rock. 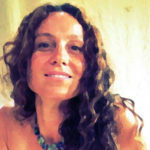 All of her vocal talent has led to her development of a unique kind of sound healing/vocal synergistics class in the recent years which she shared through workshops and classes. Omra is a beautiful clothing designer, and started an organic yoga and dancewear company, called Omra Organics. Her styles range from elegant dress wear to casual gym/yoga wear. All the material is 100% organic and made in Hawaii. This keeps the feel and the integrity of the product in high standards.